To learn and reinforce the chemical formula for photosynthesis: 6 CO + 12 H2O + light = glucose + 6 O + 6 H2O. Student each receive a game board with the photosynthesis formula on it, where each atom is represented by a circle. Players spin for molecules, and place edible tokens (such as candies, raisins, nuts or cereal) that represent atoms onto the molecule circles on the game board. 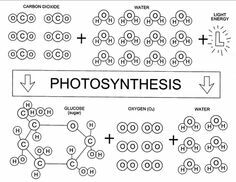 Once they have collected the necessary molecules for photosynthesis (6 carbon dioxides, 12 waters, plus light), they quickly rearrange all the atoms and molecules to form glucose, 6 oxygens and 6 waters. One round of the game usually takes about 30 minutes. If you are playing with a large school group, allow a full class period. Photocopies of the pattern pages (mostly on regular paper, except for spinner which needs card stock), spinner (requires glue and scissors and paper fastener, and cardboard if you want to make it sturdy) and lots of little edible tokens such as candies, raisins, nuts, pieces of breakfast cereal such as Cheerios, etc. It doesn’t matter what you choose as long as they are small and fit into the little squares on the playing board.